* Darüber hinaus der Bereich "The Lost Port" der sich dem Schaffen von Covenant auf abstrakte Art und Weise nähert. Darin diverse interessante Artikel die z.B. - klären, welcher Film "Like Tears in Rain" inspirierte. Die ganze Seite ist komplett zweisprachig auf Deutsch und Englisch und wird natürlich auch in Zukunft stetig ausgebaut! An dieser Stelle herzlichen Dank an ShadowByte für die kooperative Unterstützung und den Serverplatz und Euch allen viel Spaß mit der neuen Seite! - take a look at the Swedish city "Karlskrona"
- clarify which film insipred "Like Tears In Rain"
The whole page is completely bilingual and it will of course be developed continuously! A warm thank you to ShadowByte for the cooperative support and for the space on his server. And now we wish you a good time with the new page! It's absolutely fantastic! I love it. Was this the site that someone mentioned making with what Thomas had with Plastiq-Flowers? Or just the overdue makeover? Vielen vielen lieben Dank an euch alle! Thank very very much to all of you! As we started to work at the page Plastiq Flowers was alredy offline. We wanted to start out with a complete new concept. So what there is to see at the moment we collected by ourselves. I have lots of interesting links and stuff that will be built in in time for some things we would like to ask for permission firs (pictures for example) - we are no pirates after all. We want to keep this little new-born site growing. Manuel and me have no contact to Thomas but it is thinkable to add parts of the content Plastiq Flowers later on. There will be updates and new articles soon. We will announce it in the "updates" area here in the forum. If there is any topic you want to discuss about feel free to open a new thread here. brilliant!!! thank you so much for the great work, julia & manuel! btw... i'm very proud to be a tiny little part of the covenant.de! thank you! "(...) eine völlig neue Internetseite, die nicht nur sehr umfassend ist, sondern auch mit unkonventionellen Hintergrundinformationen zu überraschen weiß. Der erste Bereich - "Your Knowledge Base" - bietet eine in dieser Form einmalige und sehr umfangreiche Sammlung von Daten, Fakten und Informationen rund um Covenant. Neben aktuellen Neuigkeiten, einer akribisch recherchierten Diskographie und Songtexten findet sich eine vollständige Liveographie mit Zusatzinfos; außerdem gibt’s verschiedene Bildergalerien, interessante Links und einiges mehr. Ein etwas ungewöhnliches, aber doch interessantes Konzept wird im zweiten Bereich verfolgt, der sich "The Lost Port" nennt. Hier nähert man sich dem Schaffen der Band auf einem eher abstrakten Level und die Artikel gehen über bloße Fakten hinaus: (...)"
Wow! Das ist echt mal gute Promo! 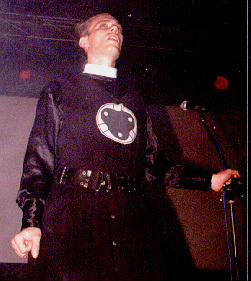 "....Covenant entered the stage as "Space Samurais"...."
Are there any photos of Covenants first concert? [e] I never even saw the plastiq flowers (shame on me). As we have no contact information with thomas, we develeloped everything from scratch: concept, struktur, grafix and content: everything is brand new. of course there might be some familiar categories like "lyrics" or "pictures" etc., just things that are expected from a fan page. [d] Ich habe die Plastiq Flowers nie gesehen (asche auf mein haupt). Da wir auch keinen Kontakt von Thomas haben, haben wir alles von Grund auf entwickelt: Konzept, Struktur, Grafik und Inhalte: Alles brandneu. Natürlich mag es Kategorien geben, die einem bekannt vorkommen, wie Lyrics oder Pictures usw., eben solche Dinge die man halt von einer Fan Page erwartet. [e] Unfortunately we don't have any fotos of the very early concerts yet. But we are going to continiue our search for pictures (and clear the rights) - and also for concert information, trying to complete the regarding categories by and by. But heres a picture of a concert in the 90s (1997: San Francisco). I don't know if this is the "Space Samurai"-Outfit, but it is not a siut. Cloths look a kind of SCFI-movie. Maybe the picture is before Covenant-career. The Space Samurai outfits can be seen in live action in the booklet for "Dreams of a Cryotank". The odd shady shapes are us on stage. It was so difficult to get pictures because of the stroboscopes were the only lights so we filmed it on video and took pictures of the TV screen (this was way before the convenient era of digital video) for the booklet.